This is part of an ‘operational games’ project, following on from trying NQM moderated by the Megablitz ‘SMART’ order system earlier in the year (Three Days in the Crimea). 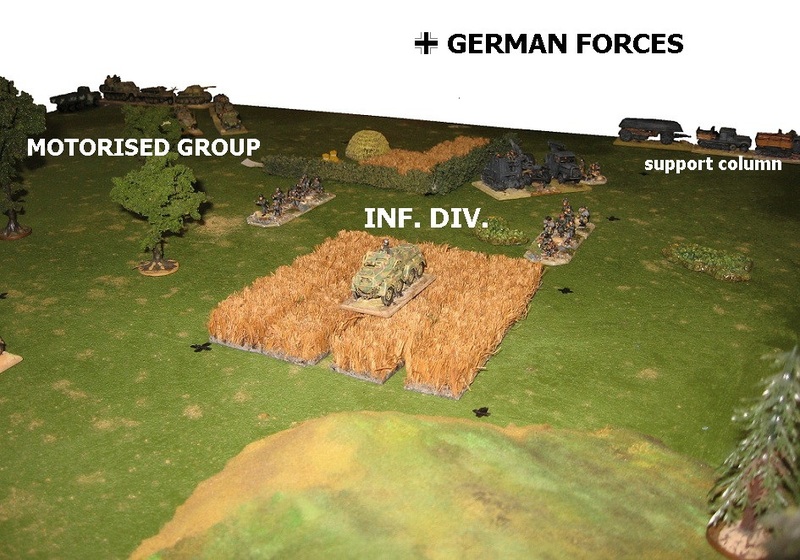 I set up a fairly abstract Eastern Front table with a Rifle Division and a couple of ad hoc armour groupings looking to defend a sector, potentially to counter attack. 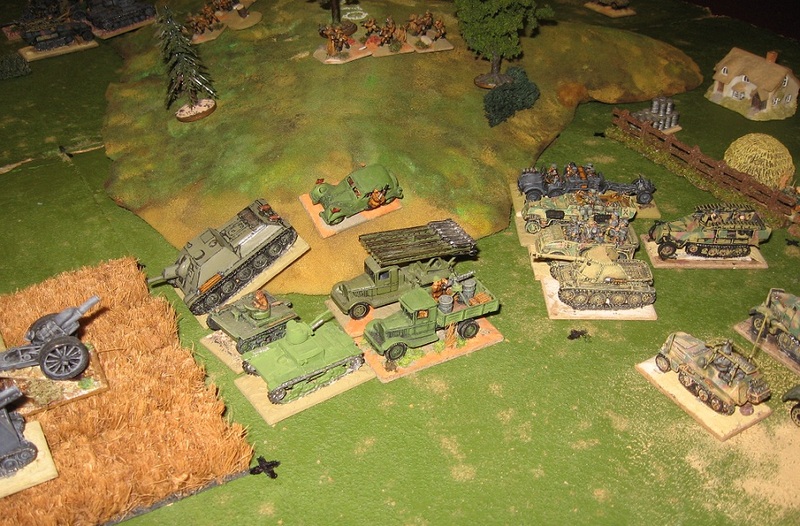 Moving up, the Germans had a Panzer Division and a motorised Kampf group with an infantry regiment supporting them. The basic plan was to play on squares rather than using measured movement on an open table. The reasons for this are simple. Both tables I commonly use are already squared – either for PBI, or because, at home, I use a modular terrain system. I wanted to be able to run games over more than one session, and find using squares facilitates a quick re-staging if you have to put the stuff away (tip: the quickest way to make notes is to take a photo or two). Further, I had it mind that a follow-up game might shift the axis and/or only retain a part of the original area (again easier to do with a big set of tiles (mapped plans etc. translate quickly onto the table). Anyway, I thought it would merit a try out. The second area of trial – and this might be of interest to beginners or occasional Megablitz players, was on notation, markers and hardware. My 15mm toys are not set up for magnetic tabs, nor do I have a full chopped up set of strength markers. I do have order markers. 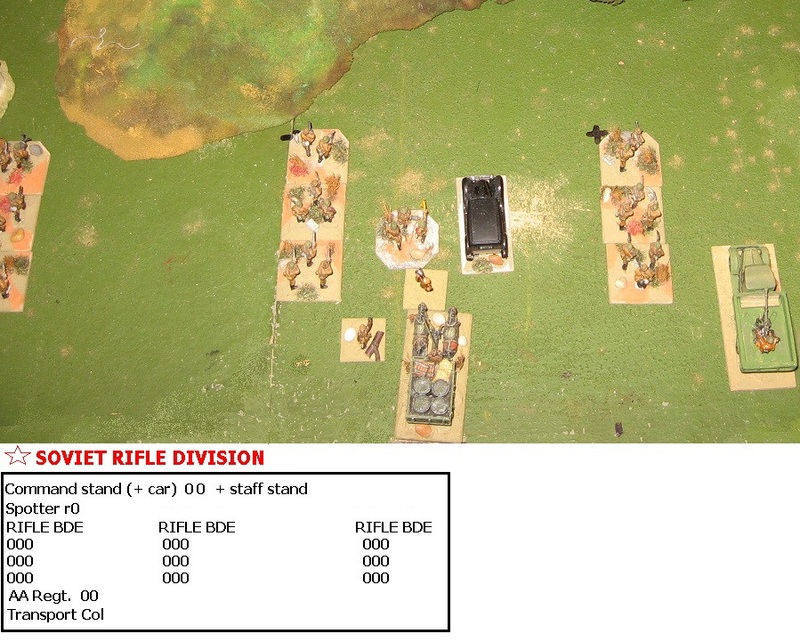 I have thought about various ways of temporary setting up, and for this game opted for very simple ‘old school’ … player managed unit rosters … On your sheet, the player has a list of the stands in the unit (in my examples with the SP listed as a string of ‘0’s ready to be struck out when hit) with its designation at the top. The current order is written in by the unit’s name. I also find that working with markers on the bases, I am one of those players who is frequently back and forth to the table, taking a peek, to keep reminded of the current SPs. So having them on a roster made tallying up for combat etc. nice and simple. 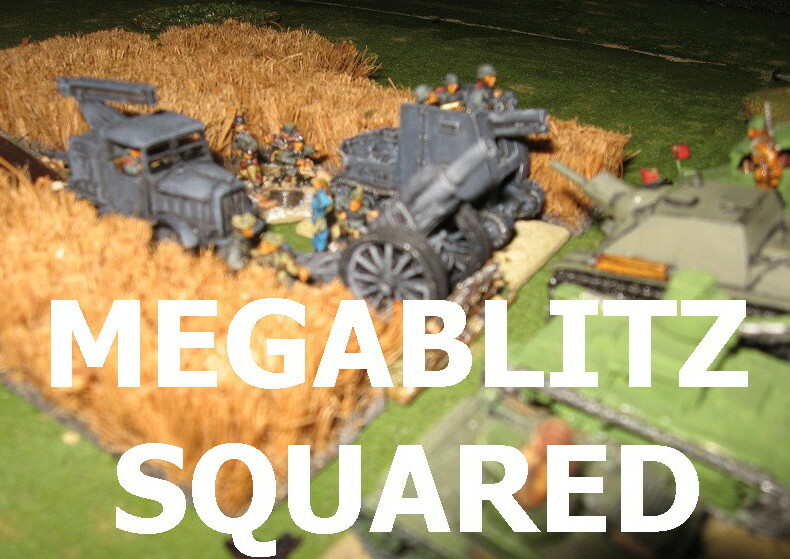 I like the orthodox Megablitz system, and it has the advantage, in a big multi-player game, of it not being necessary to tie up models with sheafs of (probably misleading) player notes and lists (the model takes its info with it). Great for umpiring big games. Me? I am tempted to run with this for a while longer as it was less clumsy than I expected. We actually played with no markers or litter on the table, but next time I will get players to place order chits where units are adjacent, I think (as it makes it clearer who fights whom). Movement Chart – distances in Squares (meanings are all exactly as in ‘Megablitz’). As a starting point, an adjusted movement table was made up, translating the Megablitz rates into ‘squares’. For simplicity, I wanted to build the movement up from the minimal ‘Unmotorised Foot can attack into the adjacent square and occupy it if they win (A Orders)’ or move one square (M Orders). The table builds up from that basic denominator. Of course, the speeds do not translate exactly, so there is a degree of fudging. As a rough rule, extrapolated from the 15mm figures (mostly on 3cm frontages), 6″ squares and Foot moves … A square is around 5km x 5km, and a turn is about 3hrs. I will continue to work on this scale issue until I am satisfied that a number of important parameters are balanced. As a way of simplifying some of the arbitration in movement, we tried the following order precedence: A can make its first move, or attack into an adjacent square. Anyone caught by this is affected. If at any point, a formation on T finds itself adjacent to an enemy on A or M, the T immediately turns to R and retreats as many squares as are necessary to avoid being attacked. Move all Recce, move all R and T orders, then M and any remaining A. Any troops on R who are unable to move into an unthreatened square surrender. 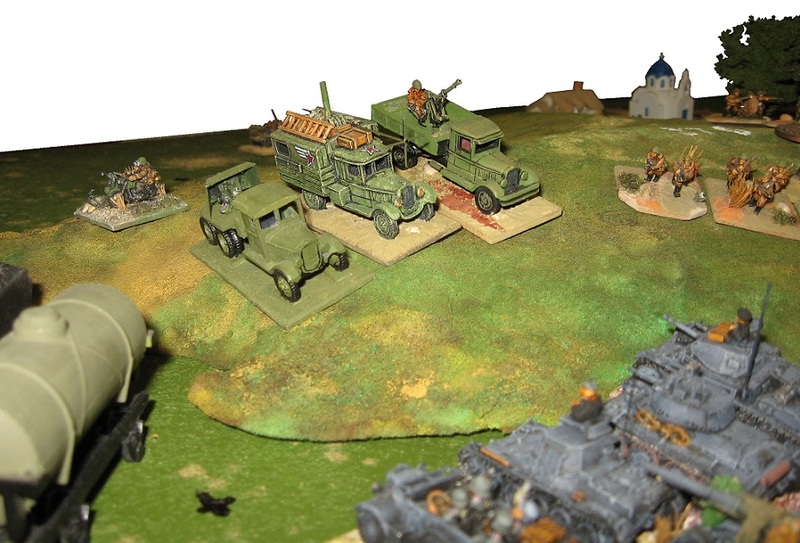 Recce drop back in front of heavier formations etc, as described in the rules. The movement system worked well. It was not unduly tested, of course, as we had only a single table in use and, being Russia, we did not have any ‘West European style trunk roads’ in play. The German ‘Leg’ Infantry tried to keep up with the motorised attack by staying on T orders too long. 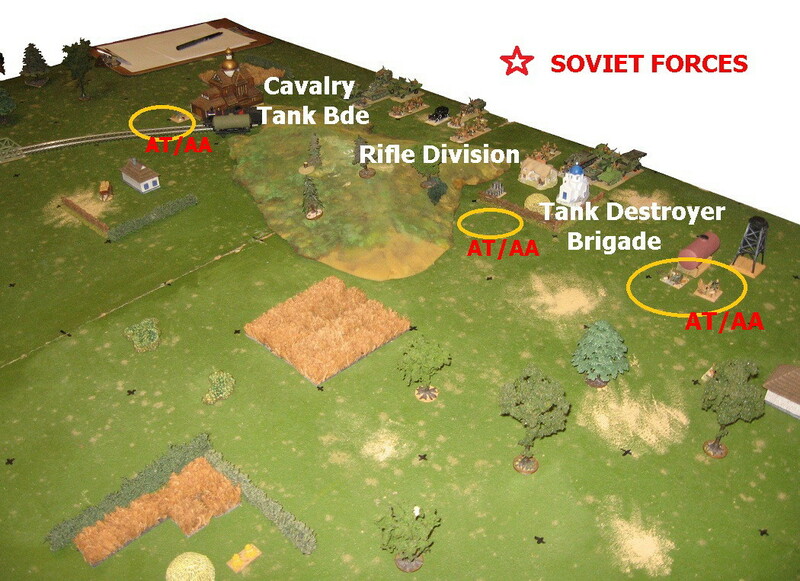 They got bounced by a Soviet Armoured counter on A orders, and fell back in full retreat on their artillery assets. Dug in, the artillery position held for a turn, long enough to allow the German motorised column to cut into the Soviet rear. Nasty. 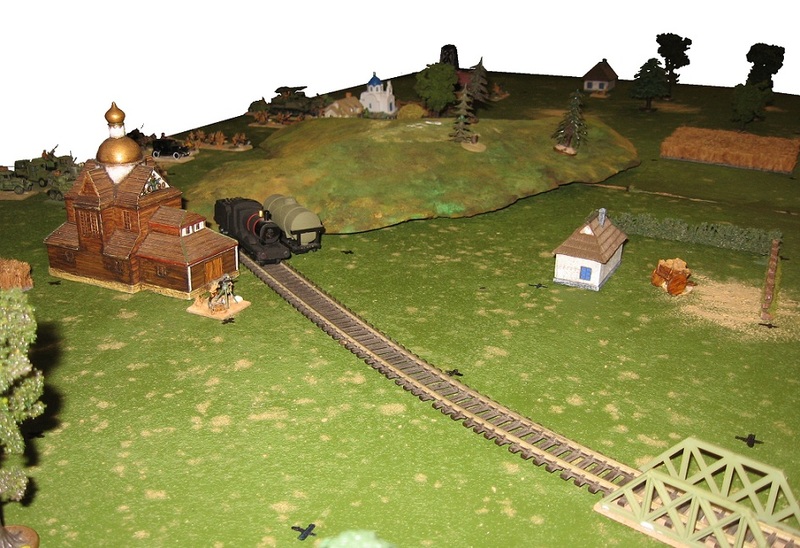 By the Rail Head, the Soviet Cavalry Tank Brigade significantly over matched itself against a Panzer Division (this was meant to be the game’s main action) … The Soviet plan (for, I must confess, t’was I) was to commit the Germans to a pre-emptive meeting engagement, then (having slowed them and bought some time) fall back on supporting troops and dug in assets. Unfortunately, the tank elements were not durable enough for the task and were wiped out in the meeting engagement. This fiasco bought little enough time, and left the Tanki’s unarmoured rear echelon completely exposed to the rampaging panzers. Oops! Actually they managed to scuttle into the urban areas, but the unit was squandered. We definitely would have profited from using two tables … and given that we did not, should – inevitably – have played down rather than across the rectangle. However, we got enough out of the game to see it working, experiment with the various orders and movement rates, and see the squares in action. Enough to progress with this interesting approach. Achtung Panzer! The Red Army rear! Very interesting, I am all for the Staff Work approach.